This fun summer dress has been designed with hot weather in mind! The dress features spaghetti straps which tie on the shoulder for a custom fit - great if you've got sloping shoulders. 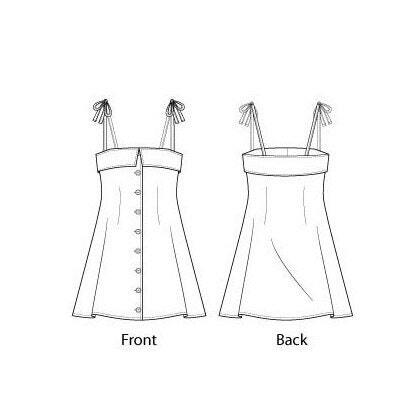 There is a fold over band along the top of the dress, which when made in a contrasting fabric can make a simple dress into something rather eye catching. And the whole dress fastens up down the front with 9 buttons. The dress is short, finishing mid thigh, which is ideal for those hot summer days, however for the more modest you may wish to lengthen the pattern to suit.